Shop Independent Durham Week (Nov. 24 to Dec. 2) promotes shopping at local Durham businesses. Look for free “Thoughtfully purchased at an Independent Durham Business” gift tags with purchases at participating businesses, to let your loved ones know your gift supports independent Durham. 42nd Annual Durham Symphony Orchestra’s Multicultural Holiday Classic (Nov. 29) at the Durham Armory. In addition to hearing beautiful music, patrons can participate in a Silent Auction bidding on incredible items donated by the Durham community and business leaders to help support the Durham Symphony Orchestra and its educational and community outreach efforts. American Tobacco Tower Lighting (Nov. 30) where you can listen to sensational community choral groups, watch our iconic tower light up, and the fun continues as everyone parades up to Blackwell Street to the CCP Plaza for the City of Durham Tree Lighting! Don’t forget to visit the “Tree of Bikes” on Burt Bee’s Patio. Parkwood Winter Fest (Dec. 1 from 2 pm to 6 pm) at the Parkwood Ball Field is a free event (open to the public) featuring food trucks, beer and hot beverages, artisan craft market, and Santa! Patchwork Holiday Market (Dec. 1-2 from 12 pm to 5 pm both days) at the Durham Armory featuring over 120 different vendors (each day will be a different set of vendors). Christmas by Candlelight (Dec. 7 & Dec. 14) at the Duke Homestead State Historic Site. Costumed guides will lead you on a candlelight tour through the historic area filled with festive decorations celebrating Christmas in the 1870’s. Enjoy traditional story telling, hot cider, and cookies. $6 for adults and $3 for kids ages 10 and under. Durham Holiday Parade and Fun Fest (Dec. 8 from 1 pm to 4 pm) starts at the Health Department (Main and Dillard Streets) and ends near Duke University East Campus (Main Street and Buchanan Boulevard). Features floats, bands, and mascots. Seating not provided so spectators are encouraged to bring their own chairs and blankets. Rain or Shine. Race 13.1 (Dec. 9) at the Northgate Mall where in a holiday-themed half marathon participants can run a 10K or a 5K race. Plenty of holiday cheer including jingle bless, drum lines, and festive music. 2018 Durham Craft Market Holiday Craft Fair (Dec. 15 from 11 am to 4 pm) at the Durham Convention Center. Have a fun afternoon finding holiday gifts for loved ones while supporting our talented local artists. Christmas Candlelight Tour Program (Dec. 15 from 6 pm to 9 pm) at the Bennett Place State Historic Site, under the glow of candlelight you can take a special guided tour around the farm and experience first hand how soldiers and civilians experienced the holidays during a time of war. Tours take place every twenty minutes (in groups of fifteen people) and tickets ($3 per adult and $2 per child) will be required. Complimentary hot cider will be available. The Durham Performing Arts Center (DPAC) hosts Carolina Ballet (Dec. 29-30) in their production of The Nutcracker Ballet. It is the only Nutcracker performance in the country that features illusions created by world-renowned magician Rick Thomas. Be amazed as characters levitate, disappear, and reappear right before your eyes. 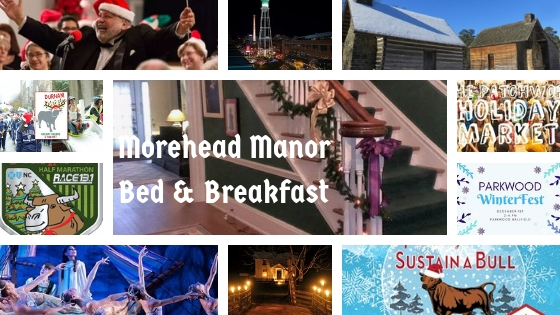 Morehead Manor Bed and Breakast, also in Durham, welcomes you to stay at our festively decorated inn. Enjoy our delicious, complimentary breakfasts each morning! This entry was posted in Holidays and tagged amazing Durham holiday events by admin. Bookmark the permalink.